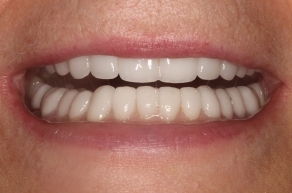 If you are suffering with missing teeth, extensive decay, bite misalignment, and/or bothersome cosmetic imperfections, a custom full mouth restoration plan may be the solution to your complex dental problems. 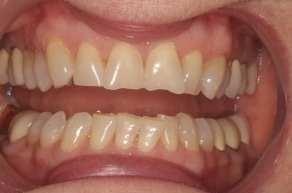 It is common for full mouth restoration candidates to have sustained significant structural damage to the teeth due to injury, rapid decline of dental health, and/or the absence of adequate dental care. Regardless of the severity of your dental condition, our experienced and highly-trained Orange County cosmetic dentist, John Cross, DDS, can develop a customized treatment plan designed to improve overall dental health and rebuild a full, beautiful smile. Prior to starting full mouth rehabilitation treatments, Dr. Cross must perform a thorough exam to properly diagnose all dental concerns, identify appropriate treatments, and discuss your personal goals. 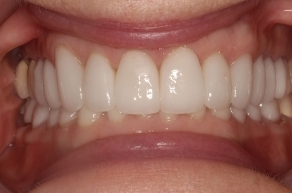 There are many restorative and cosmetic techniques that Dr. Cross can choose from to rehabilitate your smile, and the ones he selects will depend upon your dental needs, aesthetic preferences, and priorities. Invisalign® can discreetly straighten misaligned teeth with clear plastic aligners. Single-tooth dental implants can replace broken or missing teeth with restorations that replicate the look, structure, and function of a natural tooth. Dental crowns can restore structure, strength, and beauty to damaged teeth. 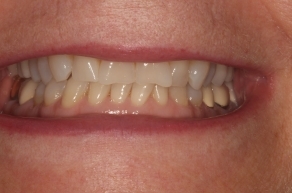 In extreme cases, one or both arches of teeth can be entirely replaced with All-on-4® implant dentures, which offer many advantages over traditional removable dentures. These are just some examples of the advanced methods Dr. Cross uses, and there are many more alternatives he may opt to employ to create the highest-quality results. Once you and Dr. Cross have selected which dental procedures are best suited to achieving your full mouth restoration goals, Dr. Cross will further develop the details and scheduling for your customized treatment plan. In most cases, a full mouth rehabilitation is completed over serval office visits or in phases. The total length of the process can depend upon which treatments are included in the plan, how long it takes to fabricate any custom restorations, your unique rate of healing, and the starting condition of your oral health. To learn how a full mouth rehabilitation can benefit you, please contact OC Lifesmiles and schedule a consultation with Dr. Cross today.